I live on a limited lot measuring 47m by 89m, but the good thing about it is its proximity to salt lake Karataban of 1 mile in diameter. The lake is just behind the backyard fence and is in the western direction in respect to the house and my HF antennas tower. You can get in idea from the picture down below showing the house and the antennas. The lake can be seen behind the house. Erecting effective 160m antenna on a small lot is a challenge. 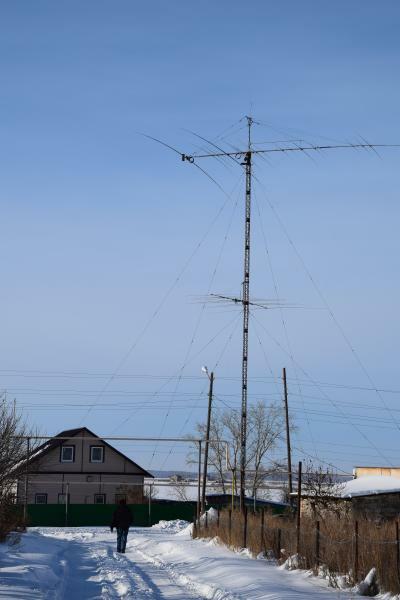 It took several attempts including a top loaded vertical of 28 mh with 20 ground radials each 40m long and laid within the property limits. The base of the vertical was 14 m away from the water, so some radials rested in the water. The antenna worked very well as I felt it. I even worked N7DD and N6TR on a long path, (or was it Short path?) with 100 Watts one December evening on Top band in 2007 with it! (What great ears you guys have!). Then someone fired up the grass on the property in spring of 2008 and the vertical, other multiband HF antenna, the fence, partly the house got badly damaged. So, I had to rebuild the damaged things. I loved my vertical, but I knew it was too noisy because of its omnidirectional pattern. I wanted some protection from the noise sources located within the village to the East of my house. So, basically I needed some directivity – gain to the West, suppression to the East. came up with a lazy sloper as I called it. See it on the picture. You can see the upper part of it (the inner conductor one) on the picture, the white wire, bent backwards to the ground at near the top of the tower(obviously, the height of the tower lacks 6 – 7 meters of height to accommodate the upper leg of half wavelength sloper). The other (the braid leg) half of the sloper is running for some 41+ meters at 3,2 m above ground towards the lake. The feed point is at 3,2mh and 21 m away from the tower. The model showed 10 dB of Front-to-Back ratio at the angle of 23 degrees. Just enough for such a simple antenna. Putting up the sloper was as easy as a piece o’cake, and only took me half a day including assembly of the antenna, the coaxial hardline, and making it up the tower. 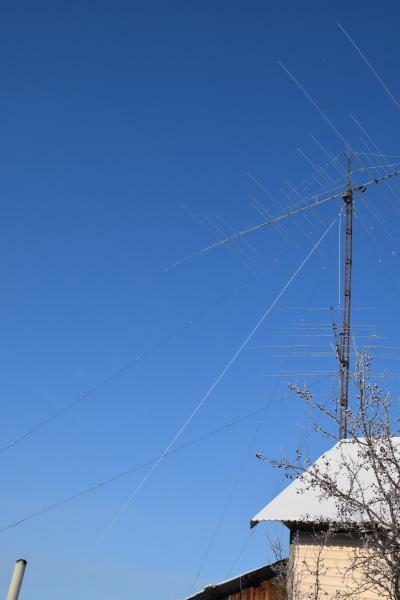 The reception was noticeably clearer on this new 160m ant compared to the vertical, and it also felt “stronger” during on the air tests with other locals. In 2009 the skimmer infrastructure was being built but not existent in the practical meaning. Nowadays it’s there and serves as a great objective instrument for all kinds of experiments! So, I just want to share the data I collected during the 28th of January 2017 in the course of CQWW CW 160 DX Contest. R8TT a very active and high scoring low band contest station in the recent times (sorry this is all I know). Oh, and the most interesting part of it all – the transmitters used in this test. I can only speak for myself. I used a home built (1982) Power amplifier that we used to run as a driver for the real amplifiers at our clubs UK9AAN, UA9AYA. The amplifier utilizes a pair of GU72 tetrodes each capable of 120 W Plate dissipation. That’s the one I still use in my everyday and contest activities through all these years up until now. I simply don’t want my neighbors go mad at me because of RFI. While looking up the data you can refer to the UD4FD skimmer picture to see when each station was running. Amazing! Some far away skimmers didn’t even hear my rivals at noticeable periods! HA6PX skimmer. 28 January 2017. GW8IZR Skimmer. 28 January 2017. DL9GTB skimmer. 28 January 2017. SV8RV skimmer. 28 January 2017. SM6FMB skimmer. 28 January 2017. G0KTN skimmer. 28 January 2017. UD4FD skimmer. 28 January 2017. I built a similar antenna a few years ago. The vertical part is designed as half of the antenna Bazooka. It was established experimentally that Sloper wins on a top loaded Vertical of 21-meter about 10 dB in the direction of maximum radiation and the same amount less in the back. It is a good antenna!